This entry was posted in Eating, Expo 2010, Weird China by Adam. Bookmark the permalink. I’ve rarely seen cuttlefish ink used in Chinese cuisine in the North of Guangdong, is it commonplace in Shanghai? Random titbit: 90% (wholesale and retail) of squid sold in Dalian (a major coastal city and seafood hub) is imported from the West coast of Africa by a gov’t owned shipping company. I saw this at Starbucks a few minutes ago when I was getting lunch. I decided to pass, but got the spinach bread instead; which I probably should’ve passed on too – think I will stick to the few things I’ve had before in the future! You know I’ve spent a lot of time in southern China Starbucks, especially in Shenzhen and Hong Kong. I was always fascinated by the menu items, and in particular, those that were somewhat of a fusion food (red bean scones, green tea muffin, etc). Someone in the Southern China operations must think these are tasty. This cuttlefish bun definitely sounds like it would be more at home even further south of you. I am curious, though, how cheesy this thing is. I’ve noticed that the mooncake flavors are often something-cheese, and yet, I would be hard-pressed to say, yup, there’s definitely cheese in those things. 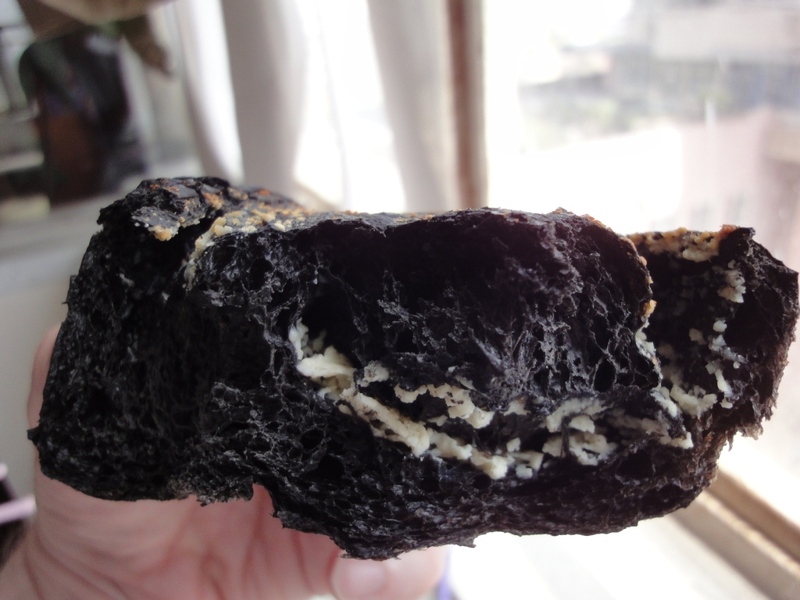 Huh, I tried the black bread in Taiwan once but didn’t know it was cuttlefish. 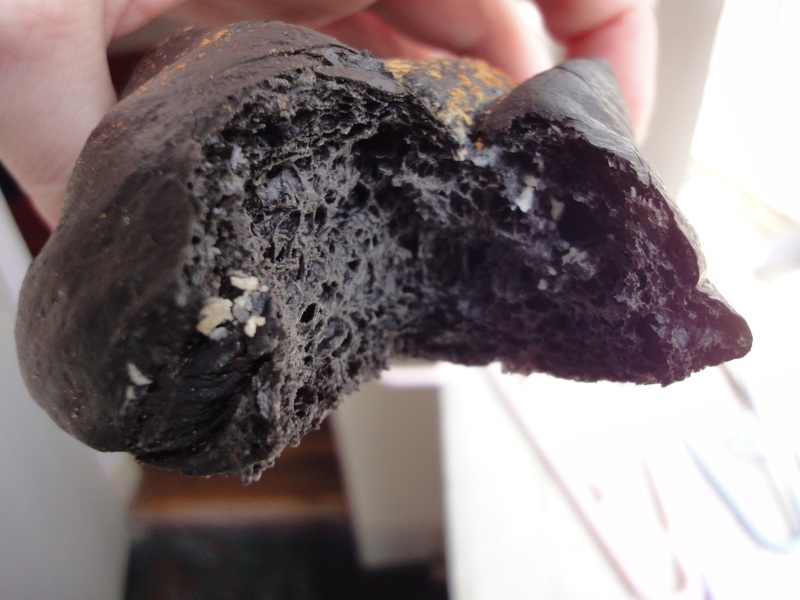 It was actually one of the best Chinese bakery items I’ve had before – but I probably wouldn’t have tried if I had known why it was black! That is the scariest thing I have ever seen that is not alive! Wait, it’s alive!!!!!! Ok; we were at a Starbucks tonight, and the rest of the summer menu is not lighting my fire–lots of black sesame with green tea and black beans. There was only one cuttlefish cheese bread left, so someone out there is loving them. Squid ink risotto, some rather high-end item in northern Italian cuisines. 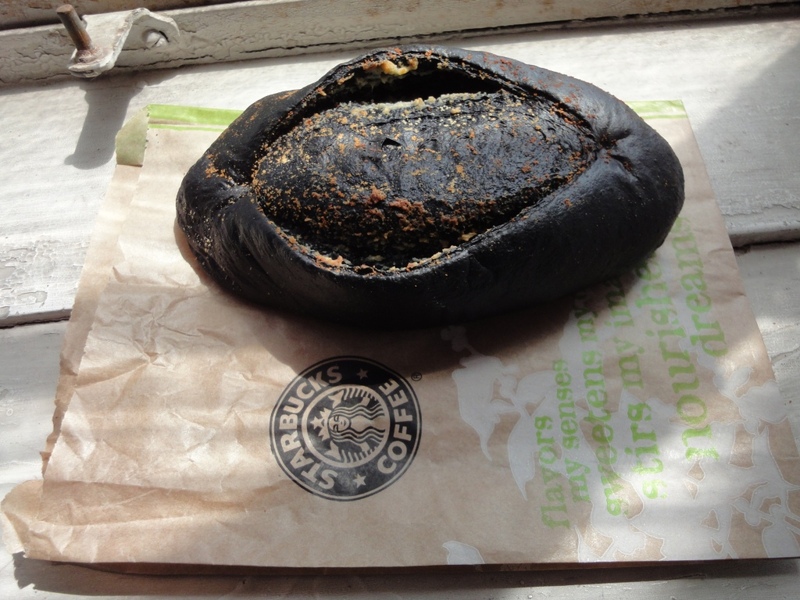 Less unintelligibly, Starbucks could have been trying to market more imitations of luxury foodstuffs; what I mean by squid ink risotto is that squid ink risotto, a Venetian dish, is a high-end food that presumably has luxury connotations. Now I doubt Starbucks has the kitchen needed to cook decent risotto, and even if they did, they’re quite liable to screw it up and break the spell that you’re enjoying an affordable luxury, leaving you with the unpleasant realization that Starbucks is just another chain. So, make something like squid ink risotto. Say, dye a yeast with cuttlefish ink, let it rise, put some cheese (I hope it’s Parmesan, not some cheese substitute) on it, and bring it to market. 85 Degrees (the Taiwanese chain on Wujiang Lu and elsewhere) has been carrying this bread since it opened in Shanghai a few years back. I agree with Maria that it’s really good. But I didn’t know about the fish link before I tried it. The experience will never be the same.